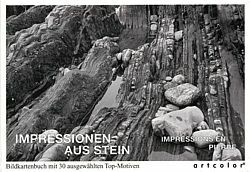 30 postcards in duoton showing some of the most beautiful stone images. For collecting or writing. Published at Artcolor Verlag, Ascheberg, Germany. Here available for € 6.80, postage and packaging not included. Now in duoton. 30 postcards showing fascinating black and white pictures of trees. For writing or just for collecting and viewing. Fresh images, displayed larger and more detailed.